The Chinese culture is known for its ethic of hard work, discipline and excellence, as well as its emphasis on family and ancestral traditions. Given that this ethnicity represents nearly one-sixth of the world's population, the parenting philosophies used within the Chinese family and culture greatly affect not just Chinese society but the larger society as well. In 1979, a one-child policy was put into place by the Chinese government to control population growth and improve economic situations. Because of this restriction, many couples prefer to have healthy male babies to preserve the family's bloodline and surname--a preference that has resulted in abandonment of female babies and sick babies. Li Rui of ChildResearch.net explains that a Chinese parent greatly values his solitary child because of the "major investment" and "national resource" the child represents. Consequently, significant amounts of money and high expectations are focused upon the child in hopes that the child will excel in academics and other areas. Traditionally, Chinese parents are highly involved in and have a great influence on their children's upbringing. "Due to the inherent makeup of Chinese family culture," says ChineseParenting.com, "it is rare to find parents who are supportive but do not have a resonable amount of influence on their child’s development." A study in the November 2005 "International Journal of Behavioral Development" by Yiyuan Xu, Jo Ann M. Farver, Zengxui Zhang, Qiang Zeng, Lidong Yu and Beiying Cai showed a strong connection between mothers' adherence to traditional Chinese values and their parenting. Women who were more true to their traditional Chinese values were apt to be more "authoritarian" to their children. In this form of parenting, children are given demands and instructions from their parents and are never permitted to question their parents. One governing principle in Chinese ethics is "mutual dependence," which means that the entire family's image is affected by the choices of a single member of the family. Because the family name and reputation play such a heavy role in Chinese society, additional pressure and expectations weigh heavily on children. A child who excels in academics, arts and sports and eventually attains a notable job with high earnings improves the image of the family. But to achieve those, it's believed that the child must undergo a tedious and strict process of pressure and discipline by parents, teachers and coaches. Generally speaking, Chinese parents use psychological control as a child-rearing tactic, often in instances of teaching or discipline. Many Chinese parents use shame as a model for instilling principles of right and wrong in their children. In comparison to American and Western styles of parenting, in which praise and positive reinforcement are emphasized to protect and promote self-esteem, Chinese parents tend to focus on the negative behavior and decisions of the child. Chinese parents may scold or even physically punish the child for the bad behavior. 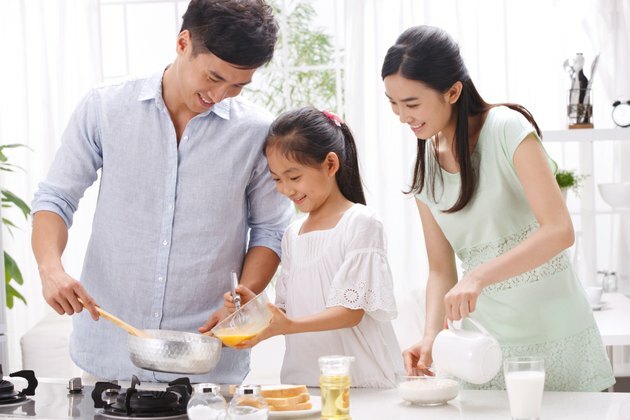 Many Chinese parents are beginning to recognize that parental responsiveness and positive reinforcement are critical components in raising an emotionally healthy and well-balanced child. This is causing a shift in the parenting paradigm from an "authoritarian" to an "authoritative" technique, which incorporates support and compassion along with discipline, says ChineseParenting.com. An article in "The Wall Street Journal" on Aug. 16, 2010, noted that while "nurturing a child’s confidence and independence is not a traditional cornerstone of Chinese child rearing," the concepts of independence and allowing room for failure and improvement are growing in popularity among Chinese parents and caregivers.